Note: When you finish this lesson, you may take the online exam for your Fiber U Certificate of Completion. How to specify tests of a completed network. Now it is time to apply what you have learned. The case studies are descriptions of networks that are typical for fiber optic installations that will require you to choose the proper components, calculate loss budgets and make other decisions as to how the cable plants should be designed. These are a series of case studies created for use as laboratory and homework exercises as part of classes preparing for the FOA CFOS/D Fiber Optic Network Design Certification. Each case study presents a scenario that is relevant to the actual work of designing a fiber optic network. For each case study, a schematic of the network or system is given, along with some basic information on the proposed communications equipment and a series of questions on the scenario presented. Each system is described generally, assuming that the student is familiar with various types of fiber optic communications systems, including what type of equipment is required and the specifics of most communications equipment transceivers. Students should use the information provided to create a basic system design, choose components, do a loss budget analysis, create a test plan and look at some alternative scenarios. All the questions should be answered. A reference table of typical specifications for fiber optic components and communications systems is given below for use in the exercises but most case studies will give specifications appropriate for the case study itself. References needed are available online as well as in the FOA textbooks. 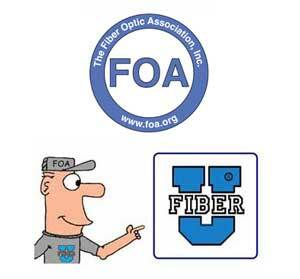 The FOA Tech Bulletin (Designing Fiber Optic Networks: http://www.thefoa.org/tech/guides/DesG.pdf and in the school site in DOC format) is directly aimed at teaching these principles. The FTTH example uses the FTTx tutorial online (http://thefoa.org/FTTX/FTTXweb/FTTX.htm). Data link and LAN standards are in the FOA Tech Topics (http://www.thefoa.org/tech/Linkspec.htm). How to calculate link loss budgets (http://www.thefoa.org/tech/lossbudg.htm) is very important. Review all the FOA Tech Topics for relevant materials. FOA YouTube Videos include videos on several of the specific topics (like data centers and OLANs) used in the case studies. See the list of current videos for relevant ones. Complete the case study exercises below. You may not want to complete all of them, but should complete the ones most relevant to your work. Note: If you are working on FOA certification, print out (PDF) your completed case studies and save along with your Fiber U Certificate of Completion for your application for certification. Representative component specifications for typical products on the market are included in the table below, but do not necessarily have to be used. LED, Laser and receiver specifications are typical numbers for use in course case studies but do not reflect any actual product specifications. LEDs couple about 5 dB less power into 50/125 fiber than 62.5/125 fiber, while it makes no difference for lasers. Higher receiver power should be considered the point at which receivers are over-driven and require attenuators. Link margin specifications for most standardized fiber optic networks are on the FOA Tech Topics Site (http://www.thefoa.org/tech/Linkspec.htm). It should be used as a reference for designers and for the courses. Remember supportable distances for some links at > 1 Gb/s are bandwidth limited. If you are working on FOA certification, print out (PDF) your completed case studies from Lesson 8 and save along with your Fiber U Certificate of Completion for your application for certification. Read more about the Fiber U Certificate of Completion program.